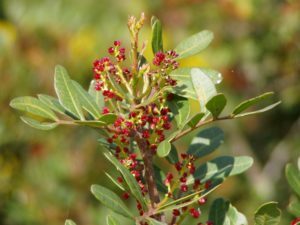 Commonly known as mastic or lentisk, this large shrub/small tree is widespread around the Mediterranean basin, Iberian peninsula and most famously Crete. The plant flowers in spring with peculiar small deeply red flowers, which contrast with the deep green of its leaves. All parts of the bush are aromatic. The pea-sized red berries are edible. Lentisk essential oil is steam distilled from the leaves and twigs (and occasionally berries or flowers). There is also a gum collected by making incisions in the stem. This can also be distilled. Many ancient writers refer to the lentisk or mastic bush. Dioscurides, in his De Materia Medica (ca 70AD), tells us that ‘Schinos is a well known tree, all its parts are warming and astringent, the fruit as well as the leaves and the bark have the same properties. A decoction of these parts is astringent and beneficial for dysenteri, diarrhea and stomach bleeding …as a mouthwash it ‘rescues loose teeth’..and it ‘cleans the face and gives it a healthy colour’. Today, many of mastic’s traditional uses are confirmed, including its beneficial effect on oral health and digestive function, although most of the studies were carried out with the gum. Mastic relieved the pain and cleared stomach ulceration within 14 days in a clinical trial, and it was found that the gum lowered cholesterol levels and liver parameters in another clinical trial.